This past summer, a popular Korean television series called Mr. Sunshine allowed viewers to have a glimpse of the Japanese colonial era through the lens of Korean independence fighters. Like the television series, “Sunset” allows readers to go back in time to the 20th century and experience some of the tensions, dilemmas, and banality of everyday life under Japanese rule. 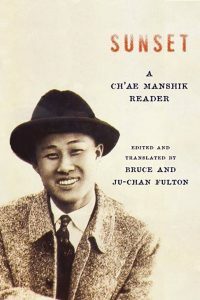 Sunset is a collection of eighteen different works of Ch’ae Manshik, a Korean author whose works were published during colonial and post-colonial Korea. The anthology not only includes short stories, but also includes a mix of genres including folktales for children, plays, roundtable discussions, essays and novellas. While the history of western colonialism is well-recorded in textbooks and other historical writing in the United States, literature about Japanese colonialism and history of the East is rarely found. In addition, unlike writings published by authors from the colonizing nations, it is often difficult to find and read works written by authors who are from the colonized nations. The works in this anthology are unique in that they are written by an author from a colonized nation, during the time his nation was being colonized. This unique element adds a layer of complexity to the writings as questions about the duty of a writer arise: is the writer’s duty to write for the people or the nation? What is truth? What kind of responsibilities must a writer carry? Because many of Ch’ae’s works were published during the colonial period, readers are forced to wonder and guess if some of his writing seem pro-Japanese due to censorship, or due to the author’s own beliefs. However, unlike works that lean extremely pro-independence, or pro-Japanese rule, many of his writings display a cynical view of both extremes. Using characters such as a local teacher or a poor farmer, Ch’ae offers a perspective of regular people whose lives remain largely unchanged post-independence. These characters are focused on putting food on the table and surviving each day, portraying the banality of life both before and after independence. On the other hand, some of his characters provide the lens of those whose lives were drastically transformed, both in a positive and negative way. In his works, there are examples of those who benefited greatly under Japanese rule and then lost all their wealth and even their physical safety after Korea’s independence. Vice versa, there are also examples of those who struggled under colonial rule but prospered post-independence. The writings naturally weave Japanese words and phrases, allowing readers to see the extent of cultural assimilation that was occurring in Korea. In addition to Japanese, reference to Americans and Christianity display the ways in which foreign beliefs and cultures were seeping into Korea and changing traditional customs. Through his use of imagery and descriptive language, readers can visualize traditional Koreans starting to wear 20th century western clothing such as a suit and classic hat. Likewise, one becomes drawn to the scene of a recently converted Christian wife who goes into hysteria upon discovering her husband’s consumption of alcohol. The diversity of the different forms of literature in this anthology not only displays Ch’ae Manshik’s creativity and technical skills as a writer, but also enables readers to experience different settings and emotions that are drawn through a particular type of writing. This anthology provides readers with historical lessons and also enables one to travel back in time to the 20th century. His diverse works allow readers to experience life in colonial and post-colonial Korea through the lens of various people of different social strata, genders and occupations. Like Ch’ae Manshik, Yi T’aejun was a 20th century Korean writer whose works were published during colonial and post-colonial Korea. In 1946, after Korea’s independence from Japan, Yi T’aejun moved to Pyongyang, North Korea, where his later works were written. Little did he know that the newly independent nation would be divided into two and that he would be unable to return to the South. Yi was eventually internally exiled in North Korea, leaving many of his works unpublished, and because of his decision to move to the North, his works were banned in South Korea until 1988. Dust and Other Stories is a collection of 12 different short stories written during and after Japanese colonial rule in Korea. The stories are presented in a chronological order, allowing readers to see both the consistency and evolution of Yi’s writing. This collection of short stories allows readers to taste some of Yi’s mastery which was inaccessible to the public for many years. The stories allow readers to have a glimpse of life in Korea both during and directly after Japanese rule. Like Ch’ae, Yi naturally weaves Japanese words and phrases into his stories, leaving evidence of the forced cultural assimilation that occurred during that time. 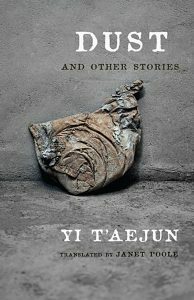 Yi’s stories depict regular citizens who bear the consequences of policies within the nation and international politics. Through Yi’s works, readers can witness a teacher who faces job insecurity because the Korean language has been reduced to an optional elective in schools during Japanese rule. Post-independence, readers can also witness some of the negative effects of humanitarian aid and its role in reducing the value of local currency and raising the price of goods and services such as school fees. Yi draws readers into each of the stories and allows us to see the ways in which outside influences have affected Korean society and culture through the lens of ordinary people. Before independence, we see families trying to survive through cultural submission, changing their names to Japanese and trying their best to please the Japanese government. On the other hand, we also see those who refuse to change their names and those who try their best to preserve Korean culture and language. Similarly, post-independence, we see those who are trying to please the Americans and assimilate into western culture. On the other hand, we also see those who are skeptical of any outside influences and desperately desire to preserve Korean cultural heritage. Many of the stories also show the perspective of a writer living in this era. Through these stories, readers can witness the inner turmoil of a writer who risks imprisonment for his refusal to write propaganda material for the Japanese government. Not only do we witness the inner turmoil of writers, we also witness various tensions between different groups of people. Readers see the tension between an old man in a rural area who is nostalgic of the past and a young man from a big city. We also witness tensions between political groups who disagree on how the newly independent nation should be governed. Ultimately, we witness the tension between the Soviet-occupied North and American-occupied South as lack of communication, myths, and international forces further divide the nation. These stories are masterfully written with themes of nationalism, loyalty, trust, and cultural preservation woven into each story. Though we do not have access to all of Yi T’aejun’s works after his exile, Dust and Other Stories allow us to experience Yi’s writing and take a glimpse of colonial and post-colonial Korea.